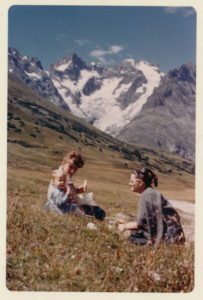 Your author, quite young, with my mother and my Nonna, in our ancestral mountains in the Italian Piedmont. We gathered around a table strewn with flower petals, each of us holding a sprig of cedar. Cedar, known by some in this part of the country as the First Ancestor. The girls, getting ready to start 6th grade in a newly-opened middle school, were asked to name a teacher or an ancestor as they laid down their sprig. Invited to participate, I named my maternal grandmother, Elena Jenny Roland – Helen, once she became an American, Nonna to me. She grew up in the Italian Piedmont, a region surrounded on three sides by the Alps. Our people were Waldensians, a tiny clan of Pre-Reformation Protestants whose cultural survival depended on the sanctuary of high places after being declared heretics by the Roman Catholic Church. The Waldensians arrived in Torre Pellice, what would become my grandparent’s hometown, in the early 13th century. My grandparents conducted their courtship in these mountains; they spent every opportunity outdoors, picnicking, climbing, hiking up with skiis on their backs and gliding down. When Mussolini declared Catholicism the official state religion and Fascist party membership was required for my grandfather to work as an engineer, they immigrated to the United States. Staying behind to serve the Resistance with his mountaineering skills, my Nonno’s brother Willy was executed in the town square by the retreating Nazis; a mountain refugio now bears his name. I never heard Nonna express any yearning for the country of her birth – only those mountains. She embraced America wholeheartedly: a Protestant country, Roosevelt, the relative freedoms despite wartime restrictions and their limited finances, and… the mountains. They lived in eastern cities but she loved the Mountain West. Gathered with those sixth grade girls naming their teachers, their ancestors, I recalled how my Nonna had instructed me in how to walk down a steep grade – “You see, you place your foot like this” – horizontally, across the mountain, “and now like this.” An adult backpacker by then, I humored her, not yet appreciating that even though I thought I didn’t need to learn this lesson, she had a strong need to impart it. Not yet appreciating the rare privilege, in this day, of receiving some ancestral wisdom, of being connected through her to a place I scarcely knew but might someday claim as a homeland. Some 35 years after my Nonna advised me on how to walk down a steep slope, I find I can’t do so without thinking of her, hearing her accent, seeing in my mind’s eye the high mountain valleys from which we came. Perhaps it’s a lesson that won’t take quite so long for my niece to learn. In the second round of remembrances around that cedar-strewn table, she named as a teacher/ancestor a man who died the year she was born, Ray Mitchell, founder of Ekone Horse Camp and the Sacred Earth Foundation. Her time at Ekone as a camper, she explained, was only possible because of Ray. As I head back to my ancestral homelands for a week in those mountains with my mother, aunt, and sister, I pray that the muscle of remembrance in this forward-looking culture of ours continues to gain strength. Read about my “Glorious Return” to our ancestral valleys in 2015. Learn more about the great work of Sacred Earth Foundation and the White Eagle Memorial Preserve (fiscal sponsor for the Death Talk Project).